It was great to see the supply chain working together to spread the aftermarket word this week. 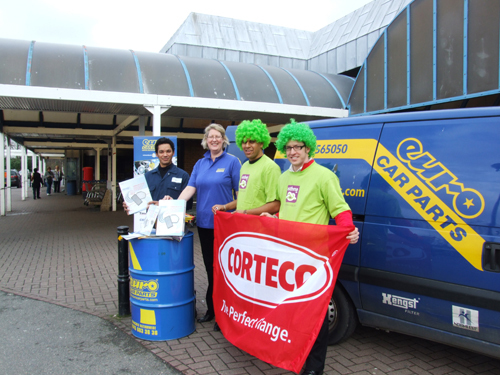 I popped along to the Brent Park Tesco superstore to see Corteco, ECP and Wembley Hill Garage in action as they helped charity Asthma UK rattle their fundraising buckets. (Well keep them quite still, actually, because apparently rattling is strictly off limits these days!). Now you might wonder what Asthma has to do with the aftermarket. Well, Corteco has teamed up with the charity to help raise awareness about the health benefits of regular cabin air filter replacement. So how did our friendly chuggers get on? Well the shoppers of Wembley are clearly a generous and health conscious lot because a surprising number of them not only made a donation, but were really interested to find out how a cabin filter can help keep respiratory conditions under control. Many of them had never even considered that their vehicle had a cabin filter before. Or were they just hypnotised by Steve Jarnetâ€™s new barnet? Taking the Putting Asthma in the Limelight campaign tag quite literally, the normally impeccably dressed UK sales manager for Corteco ditched his sartorial pride for the day to don a lime green wig â€“ and very fetching he looked too! But back to the serious matter of filters, one lady, Mrs Jackie Togher from Collingdale, told me that she had just been to visit her friendâ€™s daughter, who is recovering from an asthma attack, in hospital. She took away two filters, one for herself and her small son, and the other for her friend, and headed off round the corner to Wembley Hill Garage to get her free fitting. Calvin, Wembley Hillâ€™s main man, said he was looking forward to seeing more educated motorists in his workshop. Unsurprisingly, he said that motorists never ask for their cabin air filter to be changed without prompting. â€œMost of them donâ€™t know what it is but itâ€™s so important, especially when youâ€™re driving bumper to bumper and can smell the exhaust fumes of the car in front. The Wembley charity event was the first in a nationwide tour for Corteco. It is working together with various distribution partners and local garages in its month-long campaign.